Article reposted with permissions from author Rachel Clemens via MightyCitizen.com. According to the most recent Fundraising Effectiveness Report, nonprofits claimed a 45.5% donor retention rate in 2017. In other words, of all the donors who made a gift to a particular nonprofit in 2016, only 45.5% made another gift during 2017. This unimpressive donor retention rate — one that hasn’t snuck north of 50% in more than a decade — hounds most nonprofits. A weak donor retention rate is an alarm bell, suggesting that your mission isn’t finding enough passionate supporters. And the lower the retention rate, the more work fundraisers must do to keep the bottom line above water. Do you know your donor retention rate? The national average is 45.5% — but what’s your organization’s donor retention rate? You need to determine your rate before making any serious changes to your development efforts. You can compare donor retention rates across non-consecutive periods of time — e.g., donors who gave in Q1 2017 vs. donors who gave in Q1 2018. But we don’t recommend putting much stock into this type of comparison because it’s quite possible that some Q1 2017 donors will give again this year, but just haven’t yet. Instead, calculate your donor retention rate across consecutive periods — ideally years. Pull a report of all unique donors who gave in 2016. Pull a report of all unique donors who gave in 2016 and who gave again in 2017. Divide #2 by #1 and multiply by 100. That’s your donor retention rate for 2017. Make sure you count each donor only once, regardless of how often they gave in a particular year. There are other types of important donor retention numbers, including “new donor retention,” which measures how many first-time donors gave a second gift this year, while “lapsed donor retention” tells you how many donors who gave in 2015 (or before) but not 2016 finally gave again in 2017. How does your donor retention rate stack up against the sector’s benchmark of 45.5%? Your marketing efforts somehow missed them — e.g., inaccurate email on file, they moved to a new address, you altered your marketing calendar and missed their best time to give, etc. Your organisation can control some of these. Others are just poor luck. Let’s take a moment to explore the controllable efforts to improve your donor retention rate — listed here in increasing order of importance and impact. You don’t need to hear another lecture from yet another article about the importance of good data. You know by now that if your donor CRM isn’t up-to-date or accurate, you’re inevitably going to miss out on opportunities. If you send out a holiday fundraising email and get 500 “bounces,” that’s 500 people (i.e., potential repeat donors) who won’t get your message. And bam! Lost donations. Same goes for inaccurate mailing addresses. Even if you have your donors’ contact info updated, other data hiccups could lower your donor retention. For example, if you’re referring to Cary Ford in your emails as “Mr. Ford,” but Cary is a woman, it’s easy for her to dismiss your organisation as … disorganised. If your donation process isn’t as seamless and simple as possible, you’re losing money. 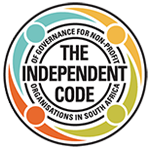 Before you do anything to expand or enhance your scalable fundraising strategy, you must invest in a thorough audit of your donor database. Fill in the key gaps, double-check unusual data. Start with your donors, then work your way to non-donors. At a minimum, you should be certain that anyone who’s ever given you money is listed with their accurate, updated name, address, email, and phone number. Because we’re concerned only with retained donors in this article, we’ve faded out the first two steps in the journey — Awareness and Engagement — and are focusing on the moment that first gift is made. Ideally, once a gift is made, the donor gets swept into a cycle of: give, get thanked immediately, get thanked a few more times, then give again. And so on forever and ever. 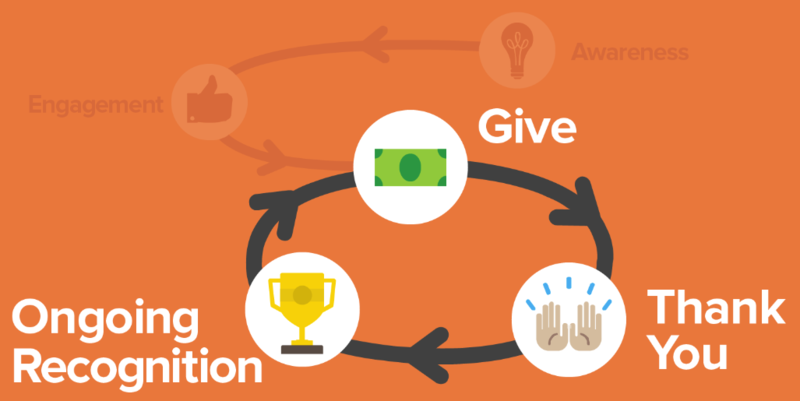 The key here is to make sure your donor retention efforts are aimed squarely at this cycle. Often, nonprofits make the mistake of treating donors as total strangers who need to achieve “awareness” and “engagement” all over again. Even if their first donation was made on a whim, donors who’ve given at least once are supporters, not strangers. Thus, the messages you craft to them — along with the channels those messages move through and the frequency with which you communicate — should be treated as such. What, how, and when you talk to someone who gave $5 eighteen months ago is substantially different than what you say to someone who’s never given anything. “Cognitive load” refers to the amount of brainpower required to complete a task. The higher the cognitive load, the fewer people who will undertake or complete the task. Here at Mighty Citizen, much of our design efforts centre around reducing cognitive load online. We want to provide users with the easiest, most satisfying experiences possible because that casts the widest net. We see it all the time: Online donation experiences that are needlessly complex, slow, confusing, unclear, and not mobile-friendly. If your donation process isn’t as seamless and simple as possible, you’re losing money. Period. This is especially frustrating for nonprofits who, in other respects, nail their marketing and fundraising efforts. You’ve convinced a previous-year donor to consider giving again, but once they cruise to your website to make their donation, they’re thrown off by the experience. And voila! Your donor retention rate dips. But there’s an additional step to make: The donation process should show the impact the donor’s about to make. 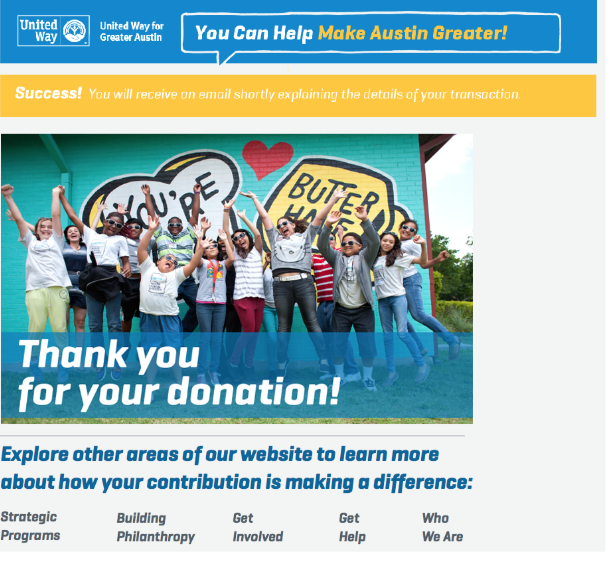 Too many nonprofits make a great case for their mission online only to abandon that messaging once the donation process starts. Remember, those few seconds when a donor is moving through the donation form are fragile and precious. You could lose them for any number of reasons. But if you keep them focused on impact even while filling out their contact info, credit card number, etc., you increase your chances of getting them to the end of the process. 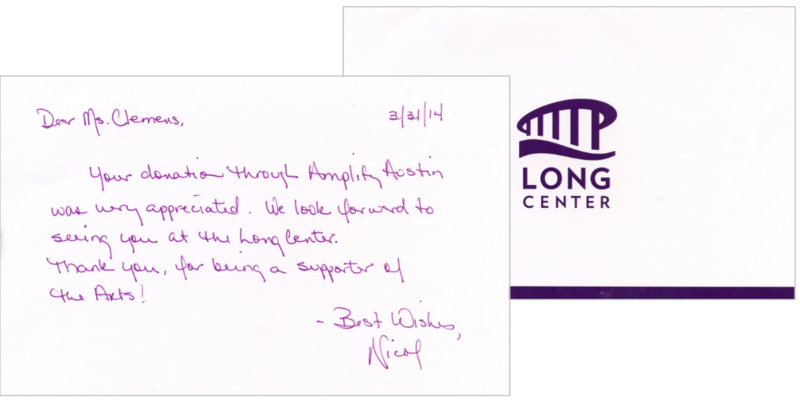 Treat your “Thank You For Donating!” page as thoughtfully as you do your donation form. Your donors will never feel better than in the seconds immediately after “submitting” their donation. Nurture that positive feeling immediately. Don’t let it fade too quickly. Use your thank-you page to boost them up, inflate their positive energy and sense of personal accomplishment. It’s not enough to build a single thank-you page. If you’re going to get one-time donors to become repeat donors, you need to thank them continuously. And to do that in a scalable, automated manner, you’ll need a plan. So, if you haven’t already, sit down with your team and craft a detailed donor thank-you plan that takes advantages of all of your resources and channels. As you can see, they’ve segmented their donors by gift amount. The more you give, the more often and uniquely you’re thanked for your gift. Having such details in place allows this example nonprofit to run their donor thanking process like clockwork. Over time, as they analyse their data — including donor retention — they’re able to refine the plan to optimist repeat donations. 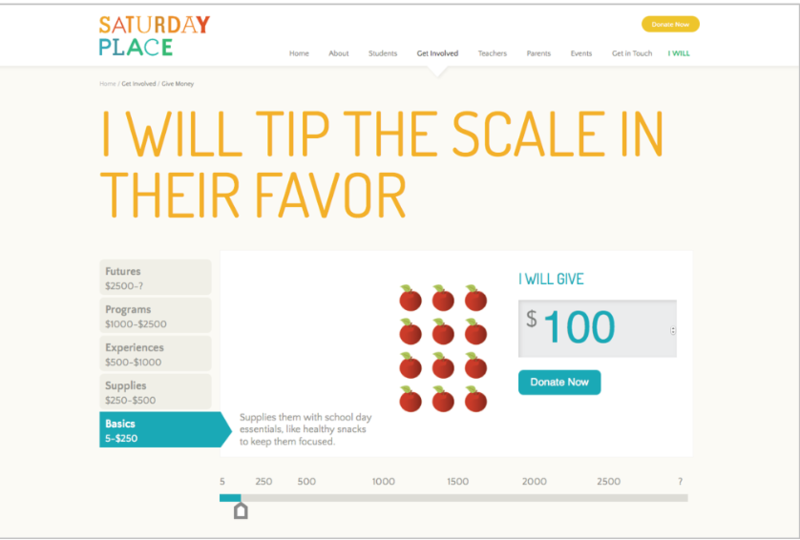 This level of segmentation also allows the nonprofit to keep an eye on the donor retention rate based on gift size. For example: If their top donors only return 25% of the time, while their smallest donors give again 50% of the time, then they can explore why that is, exactly. What are small donors getting that larger donors aren’t — or vice versa? Thank your volunteers and staff: Don’t forget about them. They’re the ones making the engine go. List your volunteers and staff by name. Stick them on your website, print posters for your office, share in your annual report, etc. And it has the added bonus of demonstrating to your donors that they’re now part of a large team of people trying to change the world. Handwritten notes: Maybe nothing is more impactful than a physical recognition handwritten by your leadership staff — Executive Director, Board members, key staff, etc. Photos and videos: Again, your goal is to remind donors of the actual, real-world impact of their gift. Showing that impact in photos or videos is far more engaging than a written “case study.” And it’s more shareable online. Make a dozen of those videos each week — (it’ll take only an hour or two to do) — and send them to your donors. They’ll feel noticed and remembered. And people who feel noticed and remembered want to chase that feeling: by donating again. Hopefully, there is no end. Hopefully, you’re crafting a detailed, robust, and on-brand donor retention plan that shatters the industry benchmarks next year. If you focus on the right part of the donor journey, make the donation process as simple as possible, and get creative with your gratitude, we’re confident you’ll see your donor retention rate blow up. This article was originally published by NPEngage. For more about the author Rachel Clemens, click here. See additional related resources on MightyCitizen.com.